Epic Games has previewed Chaos, the new physics system due to make its debut in Unreal Engine 4.23, the next-but-one update to the game engine, during its keynote at GDC 2019. The company also demoed the real-time ray tracing capabilities in Unreal Engine 4.22, currently in beta, and released the SDK for Epic Online Services, its new suite of free cross-platform game development systems. 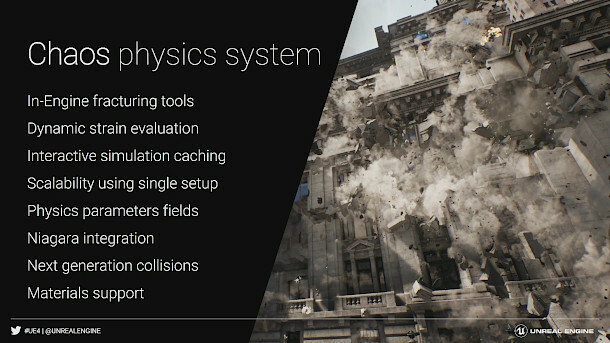 Described by Epic CTO Kim Libreri as a “Hollywood-quality physics” system, Chaos will enable users to create more complex real-time destruction effects than is possible using Unreal Engine’s existing toolsets. As evidence, the company showed a demo of Chaos physics in action, set within the world of Robo Recall, its dev-project-turned-free-VR-title. The demo showed a large urban environment with destructible scenery, with the player blowing pillars and the facades of surrounding buildings to bits with a range of high-calibre weaponry. As well as in-engine fracturing, Chaos features dynamic strain evaluation and “next-generation” collisions, and integrates with Niagara, the modular VFX editor introduced in Unreal Engine 4.20. 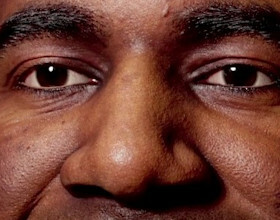 Epic Games didn’t go into detail about the feature set during the keynote, but it did show a slide summarising Chaos’s capabilities, reproduced above. The destruction toolset is due to roll out in early access in Unreal Engine 4.23 this summer, with cloth and character physics to follow in future updates. 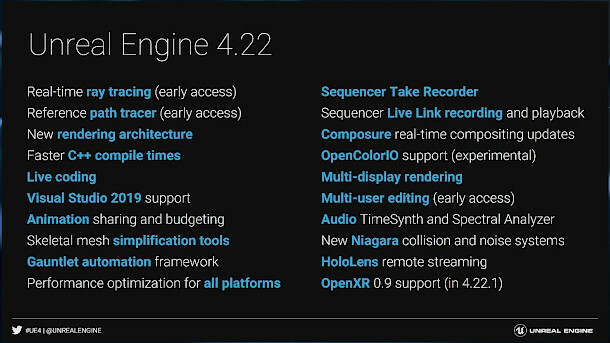 The keynote also provided a taste of the new real-time ray tracing features in Unreal Engine 4.22, currently available as a public preview. The update adds two new technologies: a hybrid rasterisation/ray tracing system and a pure path tracing engine, intended primarily as a developer reference tool. Both make use of RTX, Nvidia’s ray tracing architecture, available in its new GeForce RTX, Titan RTX and Quadro RTX graphics cards. The demo showed a clip from Troll, Swedish cinematics specialist Goodbye Kansas‘s upcoming CG short, running on a single GeForce RTX 2080 Ti GPU. Other new features in Unreal Engine 4.22 include animation sharing, designed to streamline the creation of crowd scenes, and a skeletal mesh simplification system. The update also extends the existing Niagara effects and clothing physics toolsets, and introduces experimental support for colour-management standard OpenColorIO, widely used in VFX pipelines. Programmers get a new Live Coding system, enabling C++ code to be edited while a game is running, with the changes reflected in the game in real time. A lot of work has been done under the hood, with Epic claiming that a full C++ recompile is now 30% faster than in previous releases, and incremental compilation is up to 350% faster. Outside Unreal Engine itself, Epic Games also announced the release of the SDK for Epic Online Services, a new suite of free technologies intended particularly for developers of large online multiplayer games. The services were originally developed during Epic’s work on Fortnite, but are intended to work with “any platform [and] game engine”, including Unity and Lumberyard. At present only player analytics and support ticketing systems are available, but Epic plans to roll-out in-game achievements, party matchmaking and player inventory systems later this year. The services are initially available on Windows, macOS and Linux, with support for PlayStation 4, Xbox One, Switch, iOS and Android due later this year. The firm also announced Epic MegaGrants, a “no strings attached” grant-making program designed to support innovative projects being created in Unreal Engine. The scheme replaces the existing $5 million Unreal Dev Grants fund, for which the final set of recipients was announced this week. MegaGrants goes several steps better, with Epic committing $100 million in funding over five years for UE4 games, offline animation, visualisation, training and tools development. Unreal Engine 4.22 is available in public preview for Windows, macOS and Linux, with a stable release expected later this month. Unreal Engine 4.23 is due this summer.